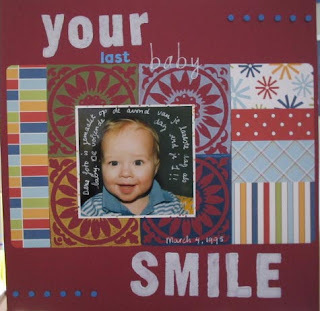 SCRAP-LOVE: Your last baby smile. A layout of Zander the day before his first birthday. I used a square foamstamp of Making Memories to make the background. Saw this idea in CK. Supplies: pp SR, square flowerstamp (MM), letterstamps (MM), acrylic paint, blue letterstickers (MM), white rub-on letters (MM), blue foam dots (selfmade), white souffle pen.